In this guide we’ll show you exactly how to throw a splitter in baseball – a fastball variation that’s a great way to pick up a third strike. A splitter is essentially a fastball that dies as it enters the strike zone. The batter thinks you’ve thrown a regular pitch until the ball loses velocity at the last moment, causing them to whiff or nick the ball harmlessly into the infield. An offshoot of the forkball, the splitter was popularised in the 1970s by Bruce Sutter after returning from surgery to find his fastball velocity had fallen off. 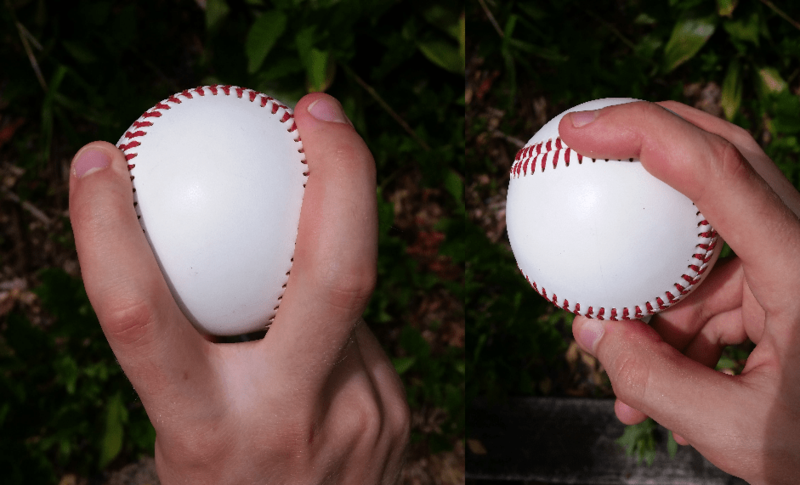 It then became one of the most popular off-speed pitches of the 1980s, and is still used to this day as an effective ball which works similar to a regular changeup. The name “splitter” is derived from “split-finger fastball,” which gives us a clue as to how to throw this devious pitch. 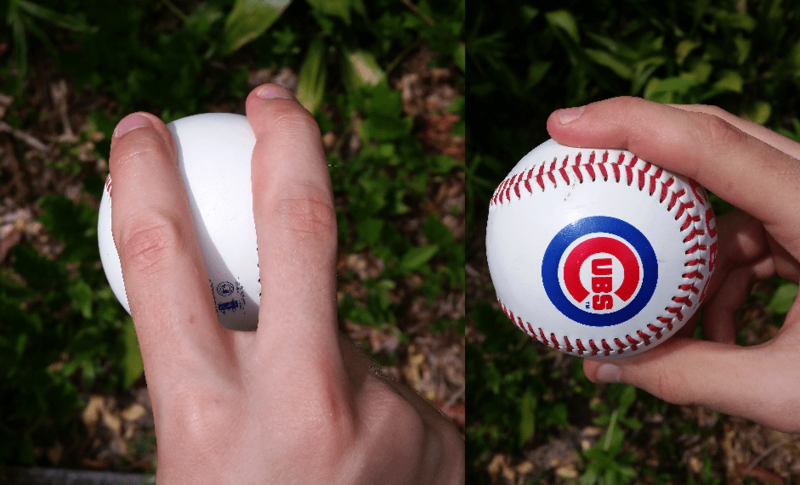 You’ll want to hold the ball similar to a regular fastball, using your thumb to support the ball at the bottom and your first and middle finger on the top of the ball. However, for a splitter, you want to “split” the seam, by moving your two fingers on top of the ball further apart. 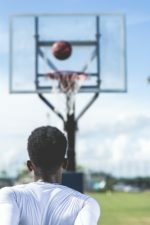 Also, to reduce the velocity late in flight, you’ll want to release the ball from further back in the hand, leaving less of a gap between the palm and the ball. Throwing a splitter is much like pitching a fastball, but you’ll want to have a slightly stiffer wrist. 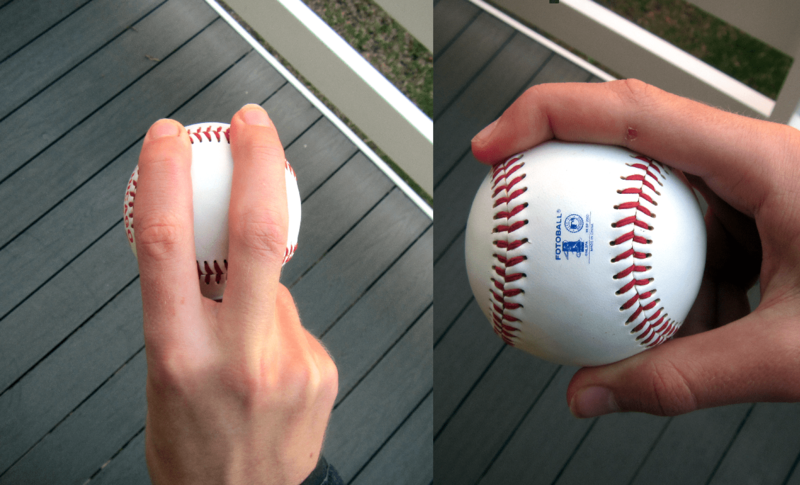 This is to avoid inducing backspin – if you do this, the ball will hang up like a normal fastball. Instead, you want a swirling sort of sidespin as we saw in Tanaka’s pitch, which is generated by your grip on the ball. Focus your eyes on the catcher’s mitt during the throw. More often than not, the ball will end up where you’re looking. Grip the ball fairly loosely, like you’re holding an egg. Your leading foot should be in line with your back foot and the batter. Make sure that the elbow on your throwing arm is above your corresponding shoulder (your right shoulder if you’re a righty) as the ball leaves your hand. This helps to avoid injury and ensures that the ball remains low. Release the ball when your hand is in front of your body. After throwing the ball, bring your hand across your opposite knee. By doing this your body absorbs the energy used rather than just your shoulder or elbow, reducing the chances of injury. Bonus tip: be sure to shield the ball with your glove before you throw it as you would with a fastball. We don’t want the batter seeing that signature split-finger grip! As with most techniques in sport, practice is key. Get used to this pitch in training before trying it out in game. Still having trouble mastering the splitter? Have a look through these common issues and fixes to solve them. I’m still throwing a regular fastball – make sure your wrist is relatively stiff and your fingers are a good distance apart (1.5-2 inches). My pitch drops too soon – move your fingers closer together, or add more power to your throw. Don’t throw too hard though as this can result in injury – build up your power slowly. I’m getting backspin rather than sidespin – try to get used to holding the ball deeper in your hand. Also try widening the distance between your first and index finger. For a closer look at Tanaka’s splitter, check out this video from the MLB. All you need is a baseball! Our pick is the Rawlings OLB3 Synthetic ball – the value packs are great for practice.